Farquhar has over the years provided all fortunate enough to visit her shores the opportunity to fish some of the finest flats the Indian Ocean has to offer. Thanks to the guesthouse on Isle du Nord, FlyCastaway now offers anglers from around the globe the opportunity to fish for the wide variety of species which frequent these waters from the comfort of a lodge. 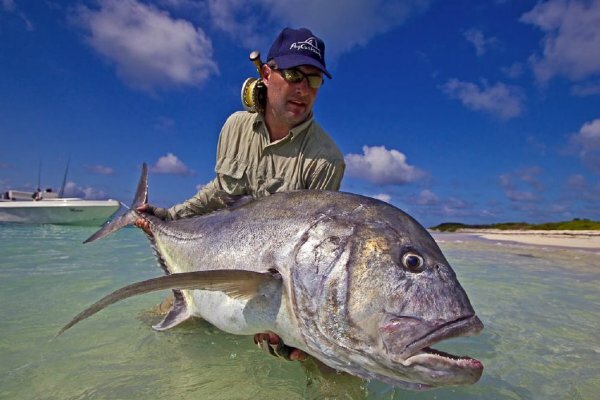 Species such as Bonefish, various Trevally species including ferocious trophy sized Giant Trevally, the finicky Indo-Pacific Permit, Triggerfish, Barracuda Bumphead Parrotfish and Milkfish call Farquhar and her rich waters home. Our guides will lead you onto the flats and help you identify the desired target species, the areas which they frequent and explain the correct techniques with which to catch them. Farquhar Atoll is the most southerly atoll in the Seychelles chain of islands lying just over 700 km to the southwest of the main island Mahe. The first part of the season traditionally runs from early November to mid December and the second part from late February to mid April, with a break over the festive season. These are the peak periods as January is one of the rainiest months in the Seychelles. From May to October the strong south-eastern monsoon winds blow incessantly. These winds bring cold water onto the flats and make fly fishing an unpleasant and unproductive experience. Typically anglers will be up early and after a quick breakfast head out to the flats to fish the first tide. We generally stay out on the flats for the whole day taking packed lunches with us when we leave the lodge in the morning. There is an option to return to the lodge for lunch before heading out later that afternoon for the second fishing session. During the midday break anglers can snorkel, or just laze around and re-hydrate in the air-conditioned guesthouse. The following day’s activities and schedule will be planned the night before between the guides and the clients, taking into account the tidal movements and the species anglers wish to target. Guests are expected to arrive in Mahe the night before or early on the morning of the day of the charter flight to Farquhar. The group will meet an hour before the scheduled departure time at the domestic terminal (next to the international terminal). The flight from Mahe to Farquhar is one hour forty five minutes onboard a private chartered Beechcraft 1900. Guests are then transferred in true island style via tractor and trailer on a short fifteen minute ride to the guesthouse, which will be your home and base for the weeks fishing. Once everyone has settled into the guesthouse there will be a briefing from the head guide on the fishing at Farquhar. The guides will then help you get all your tackle rigged for the following day’s fishing excursions. If there is still time, guests are more than welcome to fish some areas close to the lodge before sunset. The group will spend the next six days fishing and exploring the islands, flats and channels of Farquhar Atoll. On the seventh morning the group will have plenty of time to pack their gear and prepare to fly back to Mahe. The flight from Farquhar will arrive back into Mahe about mid-day. On arrival guests will connect to their international flights or overnight in Mahe. Rods: 9 weight, fast action. Reels: Saltwater, with at least 150 yards of 20lb backing. Lines: WF floating, saltwater lines such as Mastery Bonefish or Saltwater Taper. Leaders/Tippet: 9-12 foot long leaders 10-20 lbs, clear monofilament with 10 - 20 lb tippet. Flies: Green Machines #6, Gotchas #6, Tan Crazy Charlies #6, Tan and white Clouser Minnows #6, Chartreuse and white Clouser Minnows #6, Shallow Water H2O #6, Spawning Shrimp #6, Tan Velcro Crabs #2x, White Velcro Crab #2x, Fleeing Crab #8 Branham’s Swimming Crab #6, Milky Dreams #2. Reels: Saltwater, with at least 250 yards of 30-lb backing. A large arbor reel is an advantage with both fish species. Bring extra spools with backing and extra fly lines. Lines: WF floating and intermediate saltwater lines such as Mastery Tarpon or Saltwater Taper. Leaders/Tippet: 100lb – 130lb leaders, 6 feet in length are the norm.